A seriously good dram, yet not spectacular. The salty toffee side of sherry cask maured whisky. It's fairly nutty too. Think of salty caramel ice cream, almond, peanut, autumn leaf on a forest floor, and a hint of orange syrup. Remains quite nutty and toffee-ish, with a bit more of dried fruit now: fig and date. Also, there is a more pronounced earthy influence, with dunnage floor added to the spectrum. It's quite pleasant strength-wise, and is more in balance than on the nose. Stays for quite a while, and doesn't get dry nor overly spicy. This friendly finish is mainly on fruit (more towards prune now) and earthy notes (moss, leaf, dunnage). Finally, the pleasant Tobermory, true, sherry standard, and it's not clear what the basis actually gave, but not bad. The beginning was more raisin and sweet, but the finale rather reminded of Oloroso, a good balance, good saturation and depth for a small fortress. Clear, raw, raisin-tree, light sulfur notes, dried fruits - dried apricots, raisins; Burnt rusks, furniture varnish, earth colors, Pu-er, wine aromas, port tones, dried apples. Dense, raisin-tree with a greater share of wood than in the aroma, prunes, dark beer, leavard, dried apricots, kumquats. Dry, sour bitter, dark beer, lacquer notes, tart oak mustard. Toffee, bramble, cherry, banana and a whiff of sulphur. Salted toffee, cherry, blackberry and sulphur. Water adds plum and takes away most of the sulphur. Tip: No idea. Not even close. Scot? Yes, probably! 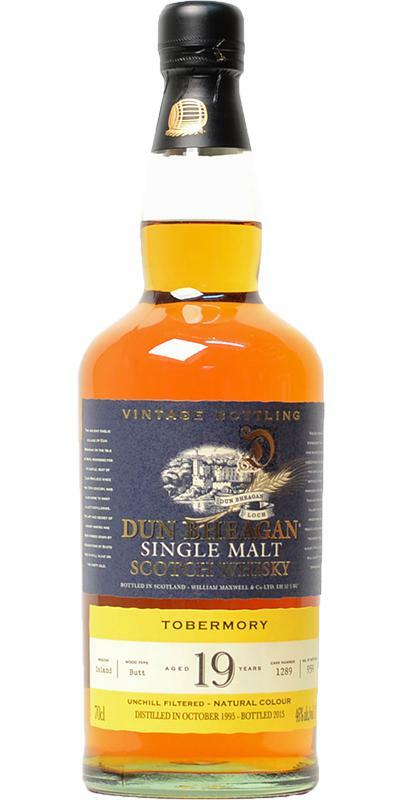 A tobermory of Dun Bheagan at the age of 19. I also like it very much. This whisky is very own and has an unusual texture in the mouth. Thumbs up! Woah! Very peppery and first slightly alcoholic. But then very spicy and "you chew your own wolf". Insanity texture: really fat and viscous. At the back, the complete range of sherry flavors. He definitely has recognition value. The aroma is not infinitely complex, but has its own sherry heaviness, in the mouth and finish then dominated by the strong oak barrel. Great, creamy Sherrymalt and despite 46% not too lax.